The Free Resources offered by the Personal Development Institute provide invaluable feedback about where you are starting your personal self development journey. 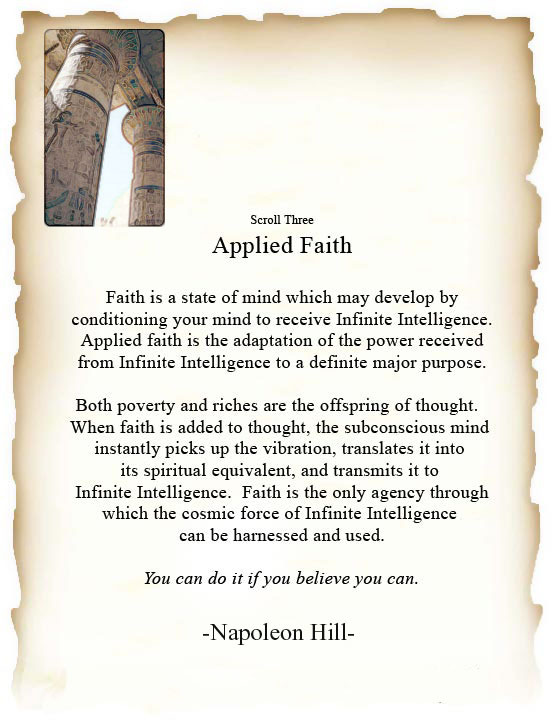 The 17 fundamental principles of the Law of Success by Napoleon Hill are free to download. 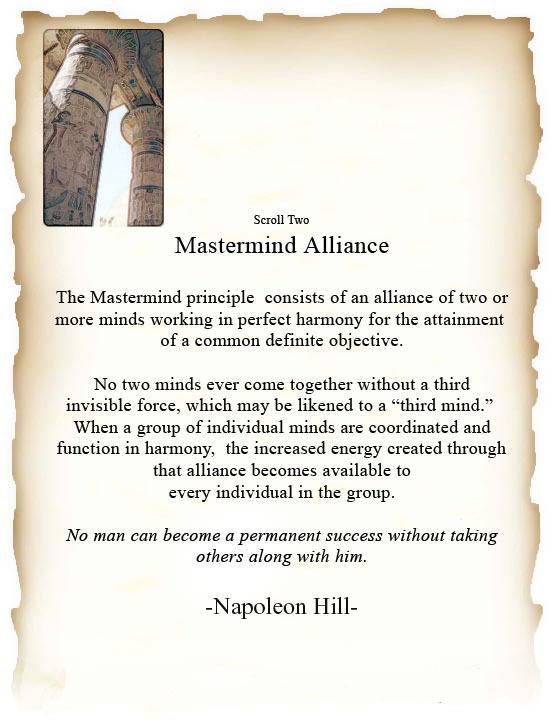 Napoleon Hill is one of the best known and most respected authors for anyone who wants to change their lives from getting by to being successful. You likely know him from his best known book Think and Grow Rich. What you may not know is that Think and Grow Rich was really a condensed version of his life long work the Law of Success in Sixteen Lessons. Andrew Carnegie commissioned Napoleon Hill to interview over 500 millionaires to find a success formula that could be used by the average person. These included Thomas Edison, Alexander Graham Bell, Henry Ford, Elmer Gates, Charles M. Schwab, Theodore Roosevelt, William Wrigley Jr., John Wanamaker, William Jennings Bryan, George Eastman, Woodrow Wilson, William H. Taft, John D. Rockefeller, F. W. Woolworth, Jennings Randolph, among others. The result of these interviews was the 16 book success course the Law of Success in Sixteen Lessons. 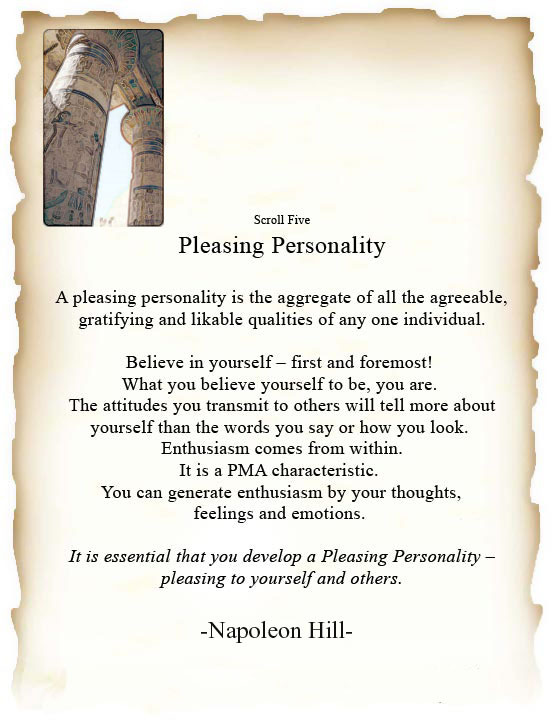 Below you will find the 17 fundamental principles of the Law of Success, free to download, in scroll form. Just click on the thumbnail and print. These scrolls are suitable for framing, and I hope you find them as useful as I have. 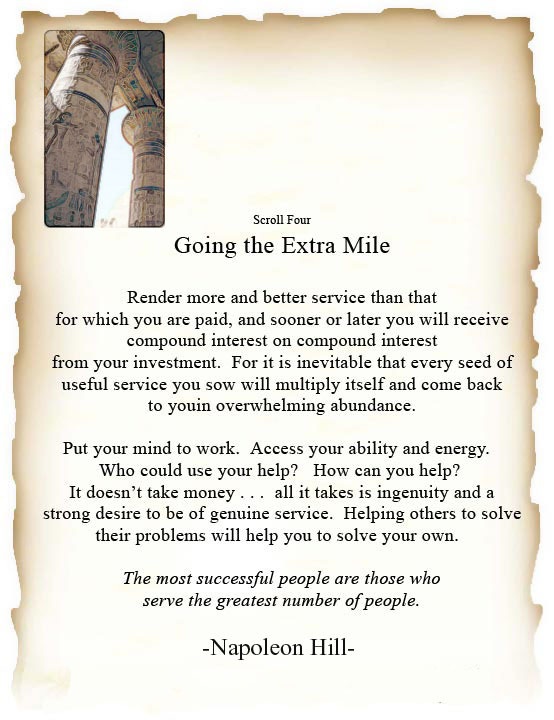 By applying many of the 17 fundamentals of Law of Success philosophy we have built a great chain of successful stores. I presume it would be of no exaggeration of fact if I said that the Woolworth Building might properly be called a monument to the soundness of these principles. - F.W. Woolworth, Founder, Woolworth stores. Remember to Click on the thumbnail to open a larger printable free version in a new window. The value of "gathering together those of a like mind" is self-evident. A Positive Mental Attitude is the right mental attitude in any given situation. Emotions are nothing but reflections of your mental attitude, which you can organize, guide, and completely control. Your personality is your greatest asset or your greatest liability because it embraces everything you control ...your mind, body, and soul. Procrastination is the archenemy of personal initiative. A Positive Mental Attitude is the single most important principle of the science of success, without which you cannot get the maximum benefit from the other sixteen principles. Success attracts success and failure attracts more failure. 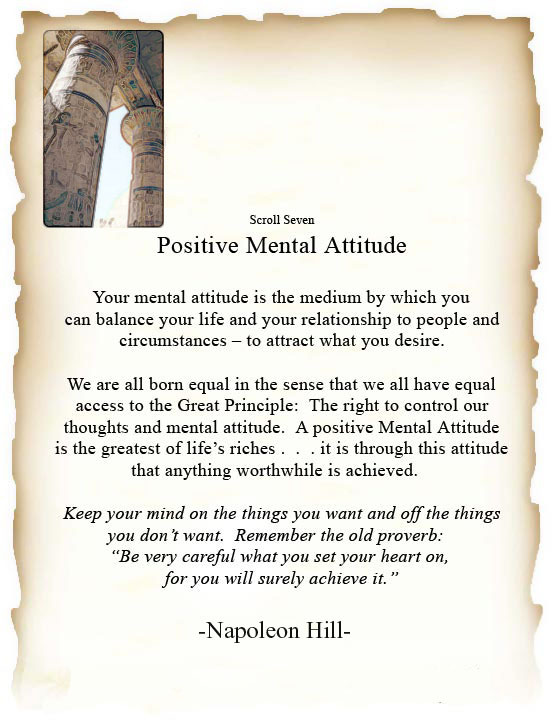 Your mental attitude is the only thing over which you, and only you, have complete control. A Positive Mental Attitude attracts opportunities for success, while a Negative Mental Attitude repels opportunities and doesn't even take advantage of them when they do come along. A positive mind finds a way it can be done... a negative mind looks for all the ways it can't be done. Enthusiasm is to progress toward success as gasoline is to a car's engine. It is the fuel that drives things forward. Enthusiasm stimulates your subconscious mind. By feeding your conscious mind with enthusiasm, you impress upon your subconscious that your burning desire and your plan for attaining it are certain. 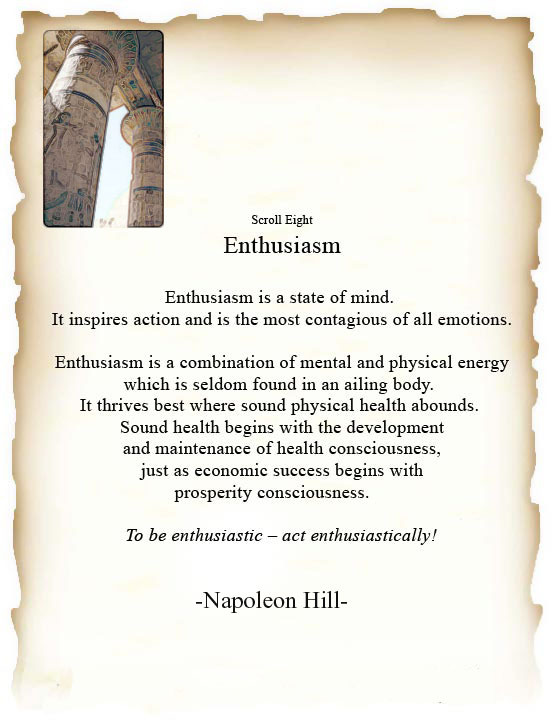 Enthusiasm is a state of mind. It inspires action and is the most contagious of all emotions. Enthusiasm is more powerful than logic, reason, or rhetoric in getting your ideas across and in winning over others to your viewpoint. Self-discipline is the process that ties together all your efforts of controlling your mind, your personal initiative, positive mental attitude and controlling your enthusiasm. Self-discipline makes you think before you act. The subconscious has access to all departments of the mind, but is not under the control of any. If you don't discipline yourself, you are sure to be disciplined by others. 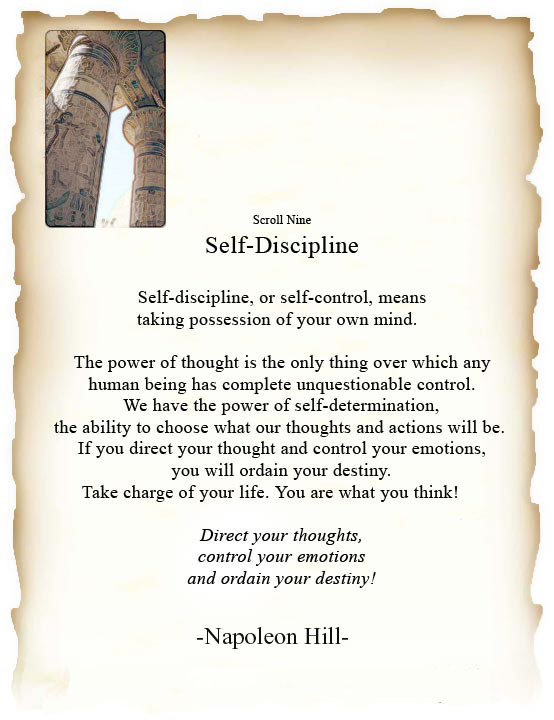 Without self-discipline, you are as dangerous as a car running downhill without brakes or steering wheel. Accurate thinkers accept no political, religious, or other type of thought, regardless of its source, until it is carefully analyzed. Accurate thinkers are the masters of their emotions. Accurate thought involves two fundamentals. First you must separate facts from information. Second you must separate facts into two classes? The important and unimportant. Keep your mind ON the things you want and OFF the things you don't want! It is much easier to focus your attention on something you believe will happen than on something you believe is unlikely. Controlled attention is the act of coordinating all the faculties of your mind and directing their combined power to a specific end. Positive and negative emotions cannot occupy your mind at the same time. There is no record of any great contribution to civilization without the cooperation of others. Enthusiasm is contagious and teamwork is the inevitable result. A good football team relies more on harmonious coordination of effort than individual skill. Most people will respond more freely to a request than they will to an order. Helping others solve their problems will help you solve your own. Everyone faces defeat. It may be a stepping-stone or a stumbling block, depending on the mental attitude with which it is faced. Failure and pain are one language through which nature speaks to every living creature. You are never a failure until you accept defeat as permanent and quit trying. Edison failed 10,000 times before perfecting the electric light bulb. Don't worry if you fail once. 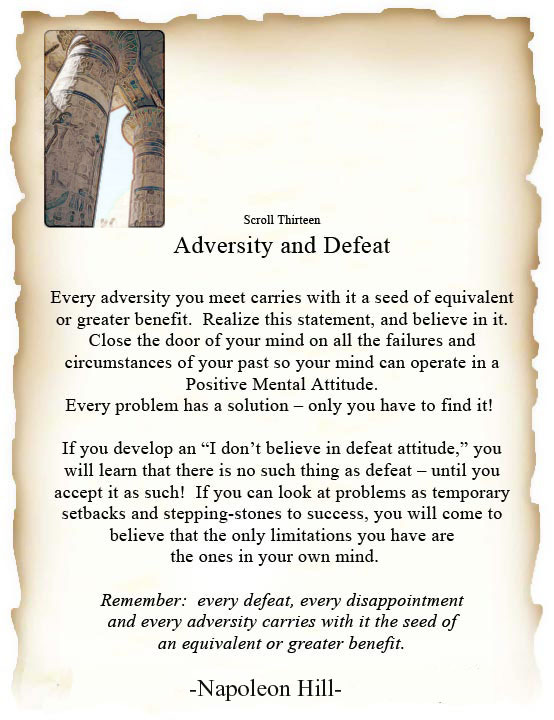 Every adversity, every failure, and every unpleasant experience carries with it the seed of an equivalent benefit which may prove to be a blessing in disguise. 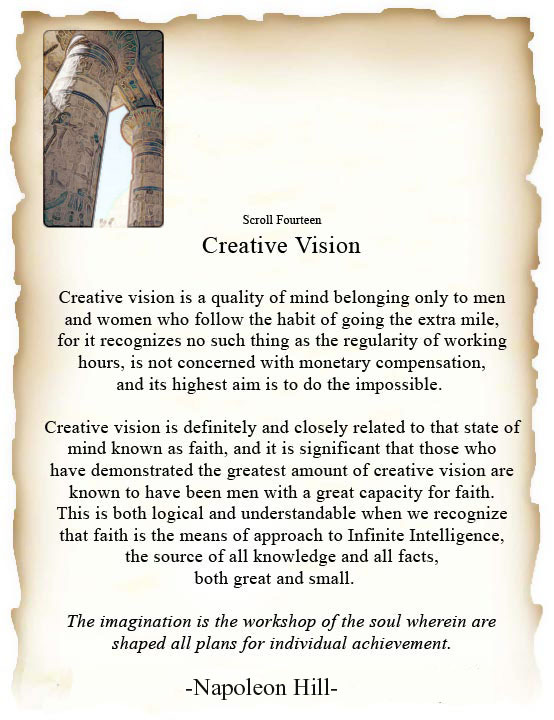 Creative imagination has its base in the subconscious and is the medium through which you recognize new ideas and newly learned facts. Synthetic imagination springs from experience and reason; creative imagination springs from your commitment to your definite purpose. Imagination recognizes limitations. Creative vision sees no limitations. Your imaginative faculty will become weak through inaction. It can be revived through use. The man who dipped a chunk of ice cream in chocolate and called it "Eskimo Pie" made a fortune for the five seconds of imagination it took to create the idea! To maintain a Positive Mental Attitude and develop a healthy mind and body, you must conquer fear and anxiety. Anything that affects your physical health also affects your mental health. 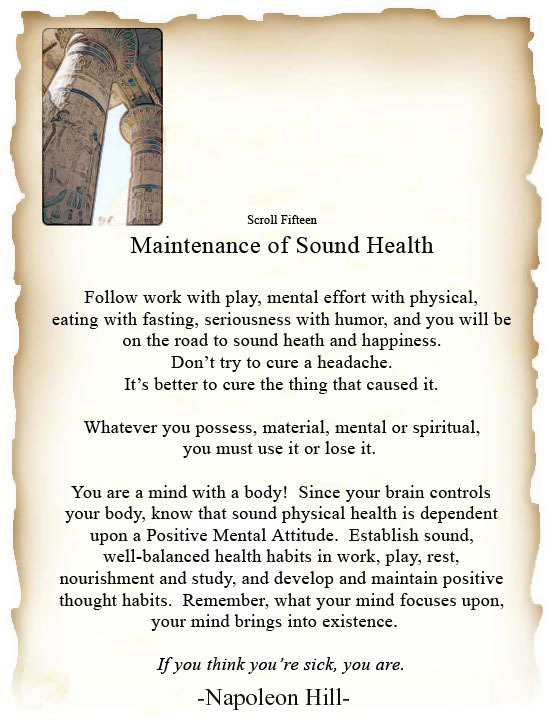 A Positive Mental Attitude is the most important quality for sound mental and physical health. Exercise produces both physical and mental buoyancy. It clears sluggishness and dullness from body and mind. If you haven't the willpower to keep your physical body in repair, you lack the power of will to maintain a positive mental attitude in other important circumstances that control your life. Tell me how you use your time and how you spend your money, and I will tell you where and what you'll be ten years from now. 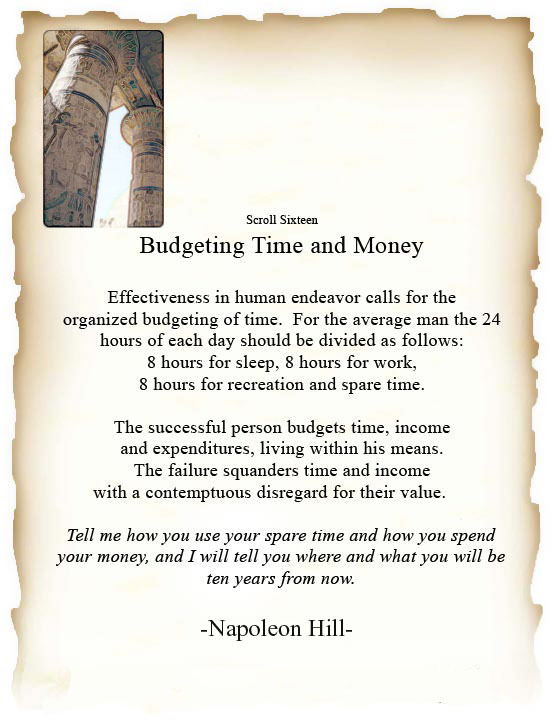 Take regular inventory of yourself to learn how and where you are spending your time and money. Time is too precious to be wasted on arguments and discontent. Some mistakes can be corrected, but not the mistake of wasting time. When time is gone, it's gone forever. It takes a habit to replace a habit. All of your successes and failures are results of habits you have formed. 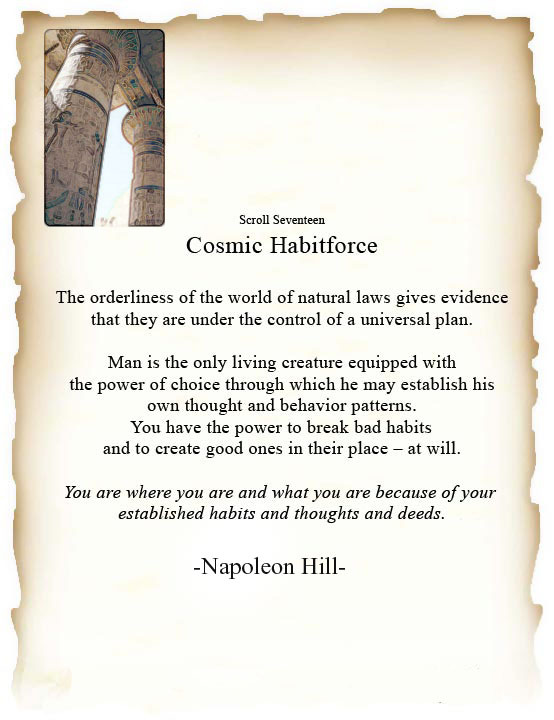 For every result there is a cause, and results are brought about through the use of cosmic habitforce. First you get a habit, then it gets you. 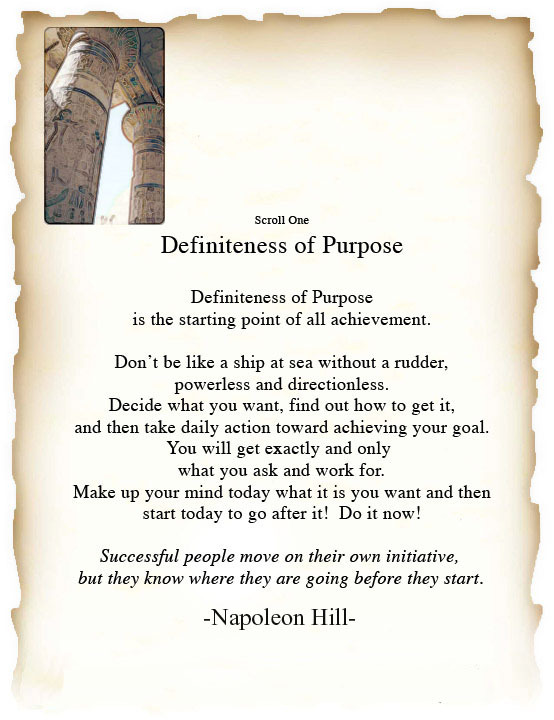 *These scrolls and the 17 fundamental principles of the law of success are quotes from the original 1928 version of The Law of Success in Sixteen Lessons by Napoleon Hill, originally published by the Ralston University Press and now in the public domain. 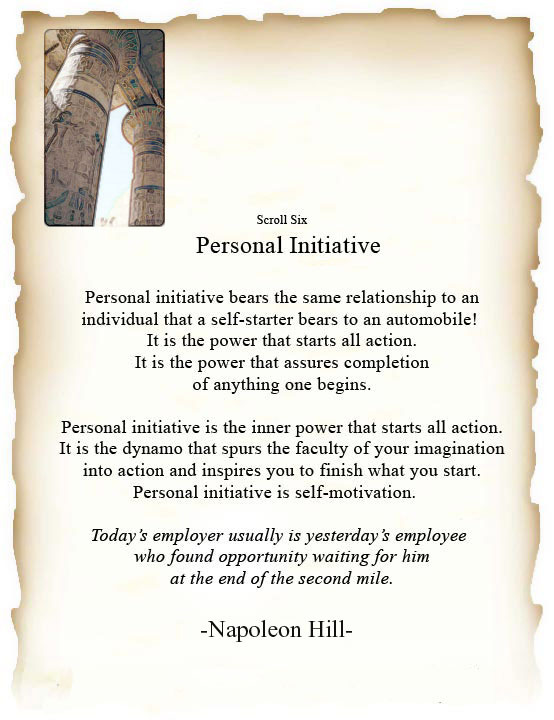 This special edition, copyright 2005 by Personal Development Institute, is not sponsored or endorsed by, or otherwise affiliated with, Napoleon Hill or his family and heirs, the Napoleon Hill Foundation, The Ralston press, or any other persons or entity.